While I am by no means a "crunchy" mom I do try to make little changes in my life that helps the world in some small way. If we all made these types of changes, together we could make a big difference. Like the Sustainable Earth motto says, if we all make our world a little greener, then the planet will be cleaner. Really, it is very easy to do, and making some green choices does not make your life harder at all! In fact, many of the products available from Sustainable Earth can make your life EASIER! I definitely found that the Sustainable Earth all purpose cleaner definitely makes my life easier. I usually use a combination of essential oils and vinegar to clean with, but when I received this bottle I began using to clean my kitchen. I am amazed and how well it cleaned my ceramic top stove. It really puts other cleaners I have used to shame, and I must admit, it does even better than my oil and vinegar combo! Our eco-preferable (compared to traditional cleaners) cleaners are a great way to lessen impact on the environment and our paper is made from 100% recycled fiber with a minimum of 40% and as much as 80% post-consumer content. No new trees are harvested for our paper and it is whitened without harmful chlorine. I also received a variety pack of Sustainable Earth disposable plates, cups, napkins and cutlery. All of the items are perfectly functional. They work just as well as any name brand paper goods I have ever used, but are better for the environment. The plates and cups are pretty heavy duty and hold even the biggest meal without bending or buckeling. Overall, I am very impressed with Sustainable Earth from Staples product and will be purchasing more for our next holiday gatherings. In an effort to lessen our impact on the environment, we've developed eco-preferable (compared to traditional paper plates, plastic cups and cutlery) alternatives to conventional paper and plastic cups, plates, bowls and cutlery. 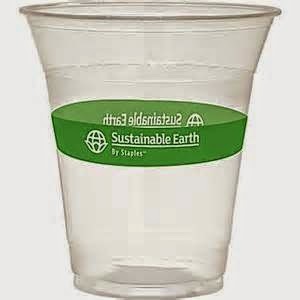 These Sustainable Earth by Staples™ products are made from renewable resources, recycled and/or compostable materials. And as always, with our name on the package you can be confident that you're getting high-quality products. I like the fact that it's environmentally friendly.